In 2008, Meir Laufer, a small-time New York real estate developer, was taking a spin aboard the London Eye, the 443-foot ferris wheel on the banks of the Thames, when he decided on a scheme: He would bring a similarly enormous ferris wheel to New York, but make it even bigger. When he got back stateside, he divulged his grand ambition to a colleague, Eric Kaufman, whose main business was converting condos. Two years after inspiration struck, however, Laufer and Kaufman were still having trouble getting their project off the ground. They had tried to secure a plot at South Street Seaport, then Governors Island, but were rebuffed by the city on both fronts. Laufer and Kaufman were looking for someone who could add gravitas to their scrappy outfit and make their dream a reality. So they arranged a meeting with Rich Marin, a financier who had just been canned by Africa Israel USA, the investment fund of Israeli diamond magnate Lev Leviev. In a stroke of prodigiously poor timing, Leviev’s firm had gone large on American real estate in 2007, just as the market was starting to crater, ultimately bringing the financial industry—and the global economy—down with it. The fund had gone on a $3 billion buying spree that included 22 marquee properties in New York, Las Vegas, Los Angeles, and Miami. Called in to steady the ship, Marin orchestrated a deft restructuring, refinancing three times, whittling down the imperious debt load to a more manageable $1.2 billion, and avoiding bankruptcy. It was a feat many thought impossible. And for all that he’d been turned out—licking its wounds, the firm pivoted away from the American market, leaving Marin high and dry. In December of 2010, Laufer and Kaufman met Marin at the Cornell Club, the Manhattan outpost of Marin’s alma mater, to get him on board. The plan, at that point, was spectacular in its simplicity: The ferris wheel would be some 600 feet tall, largest in the world, and cost some $200 million to complete. Laufer and Kaufman supplied the idea—Marin would furnish the expertise to make it happen. Marin wasn’t a construction guy—by his own estimation his construction experience could “fit in a teacup”—but he knew deals, fundraising, and finance, and he had a flair for the ambitious. If the ferris wheel worked out, a project of this stature would win him back his seat at the big boys table in the world of New York finance. After an hour of hashing out the particulars, Laufer, Kaufman, and Marin all shook hands and parted ways. Marin was in. Big things can move slowly in New York City, but Marin mounted a campaign for the city’s backing that yielded quick results. In March 2011, he went to the Bloomberg administration with the scheme, and found an enthusiastic ally. Growth of the tourism industry had been one of Bloomberg’s signature issues, and in his twelve years as mayor, he’d overseen the transformation of New York City into one of the world’s premiere urban tourist destinations. By the time Marin came knocking, tourism was already bringing the city $35 billion a year, pulling in a full third of all overseas visitors to the United States. And while Manhattan, Brooklyn, and even Queens had reaped the benefits, Staten Island, already a long-neglected borough, had been largely shut out. The mayor wanted a way to loop Staten Island into the city’s explosive growth; NYC and Co., the city’s advertising outfit, was looking for a way to sell the borough; and the Economic Development Corporation (EDC), the city’s nonprofit development arm, had been eyeing new development on the island’s North Shore. 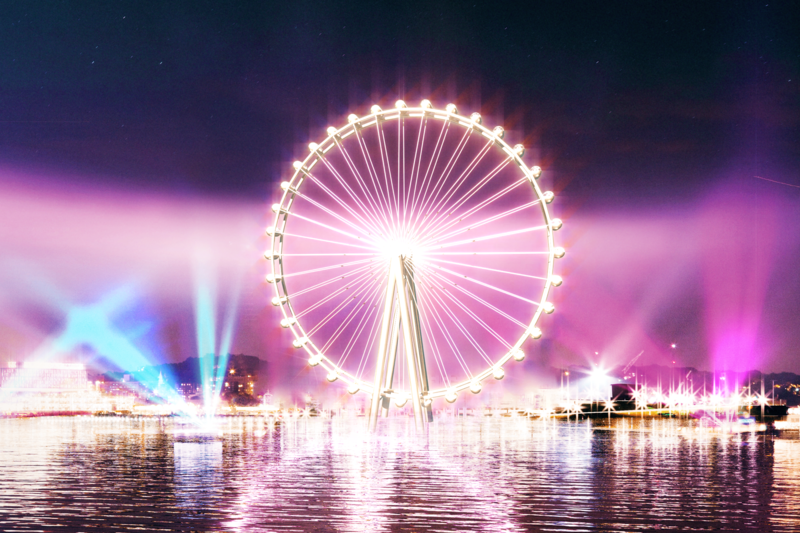 The New York Wheel emerged as one of the rare projects that would satisfy on all counts. When the EDC issued a request for ambitious development proposals for publicly owned land on the North Shore, Marin and company were first in line. Less than three years after his unceremonious defenestration from the world of high finance, Marin had landed one of the city’s highest-profile developments in the post-9/11 era. And with all the hands shaken and the dotted lines signed, the time had come for Marin to do what he did best: raise big money. It was a talent that had come to his rescue in the past, buoying him when his intricate deals went awry and his fortunes collapsed. And as fate of The Wheel unfolded—through lawsuits and counter-lawsuits, ballooning costs, and a flood of cash from Chinese investors—it became clear that it was a talent that would serve him well into the future. For people like Marin, hooked to a globalized network of easy money, there’s always a lifeline. Marin’s creative thinking in these cutting-edge transactions would prove crucial to the bank’s accelerating growth. This was still decades before Warren Buffett would deem derivatives “financial weapons of mass destruction,” but Marin was also one of the first to see their calamitous potential. In 1989, by then in charge of the entire Bankers Trust derivatives team, a dodgy deal detonated and nearly took Marin with it. His desk had issued over $100 million in futures contracts in cotton, from a merchant that had made some bad bets speculating on cotton futures. The merchant eventually filed for bankruptcy, but not before taking a chunk of Bankers Trust’s fourth-quarter profits that year. Marin was prepared to resign over the deal, but the bank mercifully reassigned him to Toronto. After a series of good decisions running Bankers Trust’s Canadian business, he was back in its good graces. Then, in, 2003, with more than 25 years at Bankers Trust under his belt, Marin relocated to the asset management team at Bear Stearns, which back then was “a sleepy backwater,” according to The New York Times. Marin, who had by then earned the nickname “Big Rich,” brought his outsize ambitions with him. He set the asset management group on a torrid growth campaign, pledging a “10 in 10” strategy—by 2010, Marin promised to increase the division’s share of Bear’s total revenue from 1 percent to 10 percent. Turning again to the esoteric financial instruments that had been both the core to his success and the key to his almost-undoing, Marin shifted the group to a hedge fund model of high profit margins and premium fees. One fund, the High Grade Structured Credit Fund, invested in bonds and securities backed by subprime mortgages; to gain leverage, it borrowed against its underlying assets. The approach succeeded wildly, so much so that the group soon launched a sister fund in summer 2006 with even higher leverage, the High Grade Structured Enhanced Leverage Fund. Marin didn’t invent derivatives, but he was among the first to realize their insane money-making power. The Asset Management team was well on its way to hitting the seemingly impossible goal of tenfold growth—if only Bear had lasted long enough to see the decade through. Just a year later, with the underlying mortgages faltering, the hedge funds began to collapse. Bear had to pony up $3.2 billion in secured loans to save the first fund, a mere glimpse of the massive bailouts that were to come. The second fund was deemed unsalvageable. Ten months later, there was no Bear Stearns. “I was the owner of the first bungalow on the beach to get hit by the tsunami,” Marin told me. It’s a telling reversal—some would describe Marin as being the tsunami, not its first victim. Either way, helping destroy an 85-year-old investment bank didn’t derail his career for long. In late 2008, Marin was picked up by Leviev’s fund to unwind the very kinds of mortgage investments that he had previously stuffed, like nails and shards of glass, into the explosive devices that tore up the global financial system. At the end of 2013, as Bloomberg was exiting office, plans for The Wheel had come into focus. It would be 635 feet tall, bigger than rival projects in Singapore and Las Vegas. It would have 36 glass pods that would fit 40 people each. A single loop on the wheel would last 38 minutes in total, complete with a light show to complement the views of lower Manhattan. All told, The Wheel would hold 1,440 paying customers per revolution, each shelling out $35 for a ticket, and run from 10 am until midnight. And the customers, the organizers claimed, were already en route. Some four million tourists were riding the free Staten Island ferry to get a glimpse of the overbooked and overcrowded Statue of Liberty, which the ferry passes by. As it was, those people weren’t even leaving the ferry terminal—with photos of Lady Liberty banked on their phones, they headed straight back to Manhattan. But with a larger-than-life attraction to keep them on the island, they’d be lining up for an experience that would rival the bright lights of Times Square. Meanwhile, Marin and his team had signed up a contractor: Mammoet Starneth, the Dutch firm that had handled the London Eye. With everything falling neatly into place, New Years Eve 2015 was circled as a tentative opening date. Marin proved his worth from the get-go. In an early hiccup, the project’s seed funding, a paltry $5 million, which Laufer had assured both Kaufman and Marin he had secured, fell through. But Marin scored an audience with some of New York City’s most endowed real estate developers: Jeffrey Feil of the Feil Organization, Lloyd Goldman of BLDG, and, eventually, Joseph Nakash of Jordache Enterprises—all billionaires with major New York portfolios. Marin caught Feil and Goldman on a good day, flush with cash after flipping a major property on Fifth Avenue. After a 45-minute pitch, they forked over the seed funding, and then some. Even with deep-pocketed billionaires on board, however, The Wheel would still need a lot more dough. Ceding hundreds of millions in equity wasn’t a compelling option, nor was a loan for a project of this scale, which would result in pricey interest rate payments. “I’m not the originator of a lot of ideas, but I am a guy who gets things done,” Marin told me. Sure enough, it was Eric Kaufman who, in a master stroke, suggested EB-5 foreign investor financing as a solution. But once the possibility had been floated, it was Marin who made the financing a reality. EB-5 is an immigrant investor visa program, first enshrined as a provision in a 1990 immigration bill signed into law by George H.W. Bush. It afforded foreign investors the chance to effectively purchase a U.S. residency on the back of a low-interest loan to an American business. The loans had to be $1 million in general, but only $500,000 if that business was located in a region whose unemployment rate was 150 percent of the national rate, so long as that loan created 10 jobs per investor. The EB-5 investors would see their loans paid back over time. For their trouble, they, as well as their spouses and any children aged 21 or under, would receive a green card. The program landed with a thud. In 1992, citing low interest, Congress added “regional centers”—business entities designated by the United States Citizenship and Immigration Service (USCIS) to administer EB-5 investments—to prop up interest in the program. But even with the regional centers in place, EB-5 didn’t prove to be a major draw for foreign investors, and what interest it did attract was checkered. The program’s early years were marred by shady foreign actors and widespread malfeasance. Investigations turned up numerous instances of tax and wire fraud throughout the 1990s, with firms providing falsified documents to cover for investors who didn’t even have the requisite funds to furnish the loans. At one point the program was shuttered entirely. The scandals continued despite numerous attempts to bring it above board in the 2000s. Well into that decade, only a fraction of the allotted 10,000 annual visas were being awarded. But in 2009, with the world’s investment markets under major duress, the program underwent an overhaul—not aimed at cleaning up its act, but relaxing its standards. In the wake of the same financial crisis that had washed out Bear Stearns, the basic solvency of the country’s major banks was in doubt and it had become nearly impossible to borrow money for large construction and development projects. So that year, USCIS launched a series of changes to the program. Construction jobs hadn’t previously counted toward the 10 jobs per investor threshold; now they would be. The number of jobs would no longer be counted by the number of W-2s issued, but rather by the amount of money spent, according to Gary Friedland, a scholar in residence at NYU Stern School of Business who has testified before Congress on the program. Even the money spent by workers on an EB-5 project—on lunch, transport, and the like—would count toward overall job creation. And the restrictions on what constituted a “high unemployment area” were relaxed so much that nearly any district could be stretched to qualify. The global financial community finally took notice. “EB-5 became extremely common after the financial crisis,” Friedland told me, “and very broad.” With the rules revised and unemployment spiking anyway, virtually every project in the country could be proven as benefiting a high unemployment area, effectively lowering the individual investment amount to $500,000 across the board. The fact that jobs were being counted by money spent and not jobs created incentivized massive cost overruns. And even though EB-5 investment would only constitute a small percentage of the money spent on a particular project—frequently between 10-30 percent—all the jobs created by that project would count toward the visas. Foreign nationals, mostly of the newly-minted Chinese upper class, began to realize the potential of a pay-for-passport program. The reward for developers was obvious. EB-5 loans would come with an interest rate that was a fraction of what might be obtained from a bank or a hedge fund. While EB-5 funding remained eligible for any American business, it quickly became exclusively the remit of real estate. Nearly 900 regional centers cropped up to help facilitate such financing. Developers reveled in the fountain of cheap capital, while foreign nationals, mostly of the newly-minted Chinese upper class, began to realize the potential of a pay-for-passport program that came at a steep discount compared to peer programs in Canada and elsewhere. In recent years, EB-5 has exploded as a premiere funding source of major real estate projects. Jared Kushner gained infamy by attempting to raise $150 million via the program to help bankroll a Jersey City skyscraper in 2017 (facing scrutiny, he dropped that fundraising effort in 2018). In New York City alone, the Four Seasons Tribeca, 111 West 57th St, and much of Billionaires Row have been funded in part by EB-5. The development of Manhattan’s Hudson Yards—the largest private real estate project in U.S. history—has significant EB-5 money, as much as $1.5 billion according to Friedland. There is now a backlog of eager applicants; the 10,000-person yearly quota has basically maxed out each of the past five years, a screaming increase from as recently as 2010, when barely 1,900 EB-5 visas were submitted for and granted. As 2013 turned to 2014, The Wheel promised to churn through capital. Marin secured a letter from a hedge fund called Highbridge Capital Management promising a $200 million construction loan. But the loan had a hefty interest rate of 10.25 percent. With some $80 million in investment from equity partners, that $200 million would have covered the estimate Marin and his team had given to the city. But as Marin signed up the contractor and looked hard at the estimates, it became clear that $250 million wasn’t going to cut it. “It was a very preliminary guess,” Marin told me. More money was going to be needed, and paying upwards of 10 percent on an additional loan was a backbreaking proposition. Kaufman, who first raised the idea of EB-5 financing, wanted a generous finders fee for his stroke of genius. “That was the only cost-effective money in the deal,” Kaufman told me. But in early 2014, EB-5 still carried an air of illegitimacy. Established real estate people found it unreliable. “They thought it was tainted stuff that you only used when you couldn’t get regular funding,” Marin said. Eventually, the investors saw it as he did. So in March of 2014, Marin journeyed to where the appetite for investor green cards was greatest: China. But no amount of money, it seemed, was enough. With that round of fundraising complete, the project’s price tag had risen to over $500 million. And it just kept rising, thanks to a confluence of factors that were both endemic to New York City construction projects and unique to The Wheel. First, there was a wave of cost overruns. The site was run by two separate contractors: Mammoet Starneth, the Dutch firm, and the construction company Gilbane. Through 2015 and into 2016, estimates from both groups continued to escalate. Yet-to-be assembled pieces languished in high-priced storage facilities in Brooklyn and six foreign countries. Problems onsite forced reevaluations. The project had to be refinanced, with the cost nudging up to $610 million. The original investors threw in more cash, while Marin wrung even more out of Highbridge and CanAm, which now had 412 investors on board to the tune of $206 million. Then there was the parking garage. As part of Staten Island agreeing to the deal, Marin had to furnish a 950-spot parking garage, replete with immersive pre-ride attractions, including a photo booth, a green roof for picnics, and possible outdoor concert venue. In addition to entertaining Wheel riders while they waited in line, the garage had to accommodate shoppers at the neighboring Empire Outlets mall. Marin wasn’t thrilled about the garage to begin with—he had wanted tourists to access The Wheel by ferry, not by car. But he grew incensed when the garage began eating away a good chunk of the project’s overall cost. By early 2016, the cost overruns had sowed serious agita amongst the investors, and the squabbling quickly turned litigious. After refusing to pony up more money, Eric Kaufman and Meir Laufer were pushed out. In an email to investors, Kaufman said the cost overruns came “without explanation”; Laufer claimed he was being run out because of his Orthodox Jewish faith. Wheel Estate LLC, the legal entity of the majority investors in the project, sued both Kaufman and Laufer for refusing to dilute their shares. Laufer and Kaufman countersued, naming Marin in February 2016 filings. Suddenly, a lot of money was being spent on lawyers. Mammoet’s departure necessitated a search for another contractor, which ate up even more money and forced the project into an indefinite delay. At the end of July, the Staten Island Advance wrote that $400 million of the reported $580 million in funding had already been spent—a whopping $250 million had gone into the parking garage alone; $80 million to recently terminated contractor Mammoet; $30 million to keep the site running. The Staten Island Advance also reported that some $300 million more would be needed to complete the project. In September, the city rejected a last-ditch request by the developers that tax-free bonds be issued to make up the difference in funding. Since the project was privately funded, it was hard to know how much money The Wheel had or needed. There were rumors that the Highbridge loan had fallen through. “So far, what we’ve seen in this case, unfortunately, is a project that is not going to be economically viable,” said Mayor Bill de Blasio. By fall 2018, the cost of completion had reportedly ballooned to over $1 billion. With the project on indefinite delay and looking increasingly unlikely, the investors turned on Marin. In January 2018, he was terminated. Nine months later, the project was pronounced dead. But on January 16, at the Delaware law offices of Richards, Layton & Finger, the New York Wheel was scrapped for parts in a bankruptcy auction. Its offerings: legs for $9.2 million; frame braces for $3.4 million; rim parts for $13 million; capsules for $23 million. The majority of the parts will be melted for scrap. In the end, Staten Island came away with a parking garage. “The developers of The New York Wheel are proud to have delivered a state-of-the art, modern 325,000 square-foot garage structure,” spokeswoman Cristyne Nicholas said. Others aren’t so pleased. “It’s unfortunate that we’re stuck with the ugliest part: a parking garage that blocks the view from Richmond Terrace,” David Goldfarb, a former president of the St. George Civic Association, told The New York Times. There’s also the concrete base, in which was buried a time capsule, filled with, among other things, a New York Wheel–shaped USB drive containing a video of how The Wheel was built; a jar of honey; and a $10,000 gift certificate from Empire Outlets. Instructions were issued for the capsule to remain concealed until 2646—630 years in the future, one for every foot of the wheel’s height. And Rich Marin quickly caught a new gig—consulting for the Eye of Texas, a 541-foot observation wheel planned in Dallas. Alexander Sammon is a reporter-researcher at The New Republic.